Tool using has now been observed in several species since the chimpanzee showed us that we are not alone in the use of implements. The New Caledonian crow has joined the rook, the Eurasian jay and the Egyptian vulture in the bird tool users club. The University of Auckland has long established how the animal uses tools such as Pandanus leaves in its forest habitat and uses some novel material to make tools under experimental conditions too. Alex H. Taylor performed this experimentation with the help of co-authors, Douglas M. Elliffe, Gavin R. Hunt, Nathan J. Emery, Nicola S. Clayton, and Russell D. Gray from both New Zealand and the UK. 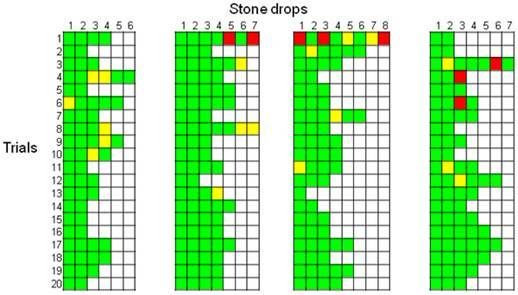 The investigation concentrated on novel tool use, using stones. Five wild crows were used from Mare, in New Caledonia and released back into the wild after the experimentation. Clear glass tubes, 18cm high and 5 cm wide, were used for a stone-dropping task. The large stones weighed 14g and small stones used were 2g in mass. 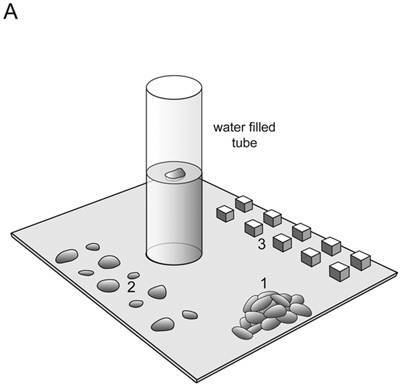 The cubes shown in the diagram were of polystyrene (0.25g) and rubber (16g) and were all the same colour. Alone in each experiment, the crow selected itself by flying down to the experimental table. Reachable height for each crow varied so meat was floated at different heights. Four crows tested could not spontaneously drop stones into the tube to reach the food, so shaping trials were carried out with a platform attached to the tube from which two stones were knocked into the water. In total ten different experiments were carried out, including some later attempts to prove sticks could be used in the same way as stones. Only eight small stones were used throughout the procedures, indicating a rapid insight, especially with a crow named Laura, which always used large stones in Experiment 3. Some experiments tested sand-filled tubes against water-filled tubes, with Laura again significantly showing more intelligence. Other experiments tested preferences for different masses of object. Lack of knowledge of stone use and the functional properties of objects did not inhibit the crows' learning. Large stones and heavy objects soon became a preferred tool, after very limited experience in some cases. Causal learning was given as the explanation, as opposed to the better known associative learning. Disappointing though it was, transference of understanding about the stones did not take place when stick experiments were tried. This indicates that these New Caledonian crows don't have "narrow-banded ability" to process information about familiar stick use, when novel tools had been presented and their use understood. We must wait now to see which cognitive mechanisms are responsible for the crow's processing of causal learning. In some ways, it's our understanding that's being tested as well as the crows!